I begin by saying I still get butterflies when giving a speech to a large, unfamiliar audience. Who doesn't? You may share in these same butterflies too. You might even say "butterflies"- a total understatement. Maybe what you feel is more extreme- nervous, palms sweat, stomach in knots, voice shakes and an overall state of fear. The fear of public speaking is a true problem for hundreds and thousands of people all over the world. You are not alone. Even though research has found it is nearly impossible to rid ourselves completely of fear, we can do some simple things to improve upon it. Many years ago I watched a coworker give a speech. He was petrified. His voice shook. He tried to give the speech without his notes but the words just couldn't come to him. When he stopped to take out his notes from his pocket, his hands were trembling. It was painful to watch him suffer. I just wanted to shout out, "It's going to be okay." 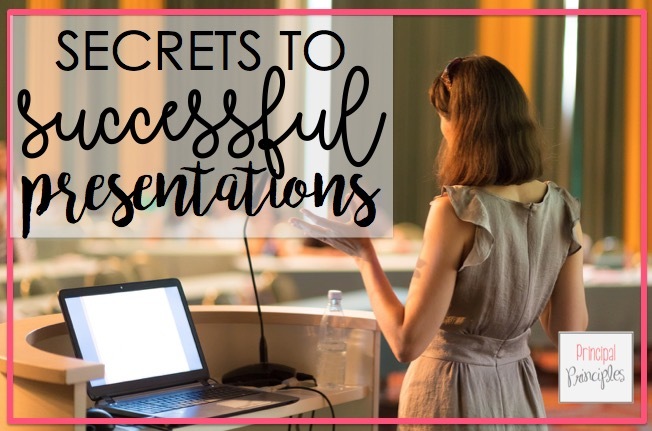 Let's talk about ways you can reign that fear in so you can have successful presentations. Find out what your audience really wants to know. How can you help them? Share your experiences and how it has worked for you. Maybe you want to start a new program on campus or change up the current school schedule- share how it will benefit them. Everyone wants to know it will make their life easier or better. I believe that is just human nature. It doesn't matter if your audience is made up of parents, teachers, administrators or community officials, connect with them. You can connect through stories, experiences, pictures and videos. These all help to bring your topic to life. Humans are wired to listen to stories. It engages us. Stories take us on a journey. I love beginning every presentation with something funny. It might be a video. It might be an activity or as simple as a joke. Laughter has been proven to lighten the mood and soothe tension. If the topic of discussion is one that might not be taken lightly, start with a bit of humor. This lightens the mood for you and the audience. Laughter also strengthens relationships, attracts others, enhances teamwork, helps defuse conflict and promotes group bonding. Please note: For some topics, this idea might be inappropriate. Build your confidence so you can shine through the presentation. If you have a little bit of nervousness, that is certainly okay. That might even play in your favor. However, too much fear makes the audience nervous for you. Confidence is very underrated. It isn't something we are born with. It is something that builds over time. Even if you don't feel confident...fake it. You can simply appear to be confident by making eye contact, projecting your voice and displaying a relaxed body posture. We all have problems. Our schools and business face problems every day. Maybe our problem is that we need a dynamic discipline program, a new teacher mentoring program, or we need to revamp our reading program, or integrate writing across the curriculum or we need to learn how to analyze data... the list goes on and on. These are real problems. You might just have the solution. You have the secret sauce to bring about change and make it better. Share that! This will set you apart from everyone else. Some of the best conferences and seminars I have attended were based on this idea. I leave with a ton of ideas and saying to myself, "why didn't I think of that." Well practice is no surprise. A speech not practice will only make you even more nervous. I'm not saying to memorize it but you know it well enough so you aren't reading your slides. That's a big NO-NO. Rehearse enough that the words flow and become second nature. The idea is to give the speech with meaning and authenticity. Take a moment and realize everyone wants you to succeed. They are rooting for you. You can do it. I promise you the speech will be better than you could ever image. Most often we are too critical of ourselves and set outlandish expectations. Just concentrate on your message. Focus on it and not the anxiety and nervousness. I attended a presentation by an expert in engagement. However, the presentation was not engaging. It was one of those - W.O.T. meetings (pronounced WHAT). W.O.T. stands for waste of time. She just read the slides and told us about how to be engaging but wasn't so herself. The audience wants to interact. Don't have them Sit and Get. Have the audience talk, share, ask questions, interact with each other and have a chance to apply what you are discussing. I hope you found these simple tips helpful. The next time you prepare a speech or presentation know that I'm rooting for you. You can do it!